A few weeks ago I made sweet scones as part of a special afternoon tea for Mum and Dad on Mothering Sunday and they were a great success. So last weekend on Father’s Day, with Mum and Dad coming to tea again, I decided to make scones again, but this time Savoury ones: with cheese both in the mix and crusted on the top. It is a lovely flavourful recipe with the strong cheese flavour enhanced by mustard and cayenne pepper giving a spicy bite, the strength of which of course can be adjusted to taste. They would also be delicious with a little fried onion added to the mix or on top – or both. These scones are perfect at tea time or in lunch boxes, at Summer picnics or served with a warming Winter soup in place of bread. As with the sweet scones the source for this recipe was Delia Smith’s recipe Cheese Crusted Scones from the original version of her Book of Cakes. It is a straightforward fairly standard cheese scone recipe and I made it exactly as per the instructions, apart from slightly lessening the spices. In particular I used less cayenne as the one I have from our local ethnic shop is rather fiery. I didn’t want to spoil the scones by making them too hot! The recipe below is a doubled version: somehow the eight smallish scones I made didn’t seem enough. As with the sweet scones I have added a list of other savoury scones further down this page: recipes from books I own and from cookery sites online that I may well make at some point. If I do make any and post them on this site I will add a link. 1. Preheat the oven to 220oC/425oF/Gas 7 and thoroughly grease a large baking sheet (or two smaller ones). 2. Sift the flour into a bowl along with the mustard powder, salt and half of the cayenne pepper and mix together. 3. Rub in the butter with finger tips until well combined. Mix in most of the grated cheese leaving the remainder (around a generous 2 tbsp) to use later as a topping. 4. Beat the eggs with 4tbsp milk and add to the dry ingredients. Mix together to form a soft dough that leaves the bowl clean, adding a little more milk as required if the mixture seems dry. Try to avoid working the mixture too much as this will make the scones hard. 5. On a well floured surface, to avoid sticking, gently roll the dough as evenly as possible to a thickness of ¾inch/2cm. I like to cut savoury scones into square shapes (using rounds for sweet scones) and this can be done with a knife. If the dough is formed into an oblong shape it can be cut into the required number of equally sized pieces which will avoid it having to be reworked. Depending on size required, bearing in mind they will rise in the oven, aim for 12-16 pieces. 6. Brush the tops with a little more milk, sprinkle equally with the reserved cheese and, if you wish, very lightly dush with some more cayenne pepper. 7. Place evenly spaced on the baking sheets, allowing a little room for rising. Bake for 12-15 minutes (or a little longer if necessary) until the cheese has started to crust and the scones are browned. Cool on a wire rack. 8. Serve warm or cold with or without butter but the scones are best eaten the day they are cooked. Next day reheating a little is recommended. Fillings such as ham, tuna, chutney or tomato are also suggested, as is topping with a fried, poached or scrambled egg. Proper salting is a lengthy, fairly complicated process and special equipment or controlled conditions are needed to dry the fish thoroughly and safely. …the fish is cured in salt in what’s called a “pound” – a square bin where you let the fish soak in salt for about 21 days. If you want a less salty version called “shore fish,” you lightly sprinkle the fish with salt and let it cure for only a couple days. I would certainly not re-freeze fish salted by this method as I am not sure enough that this can be done safely. If salting fresh fish, rather than frozen, it could be frozen once salted. Below is my version of salted fish. My picture was taken 24hrs after salting. In the end I consider this a simple way of lightly salting fish, providing the process takes place two days ahead of the date the fish is required. It is a method I would be happy to use again, especially as I prefer the milder flavour, but I will probably also continue to buy the blocks of salted fish as they are so convenient. Other useful links are this overview of Salt fish giving a helpful list of types and names around the world, this article at ehow with a similar method to that given by Rick Stein and this enlightening Ezine Article. I would be interested to hear from any readers who have successfully tried salting fish at home by the Rick Stein method, or similar. If you have not smelled salt fish then you would be advised to do so before you make your own to give a guideline. Salt fish has a different, much stronger, aroma from fresh fish but if really unpleasant then discard the fish and do not take the risk. Often purchased salt fish smells particularly strong but we have never suffered ill effects. 1. 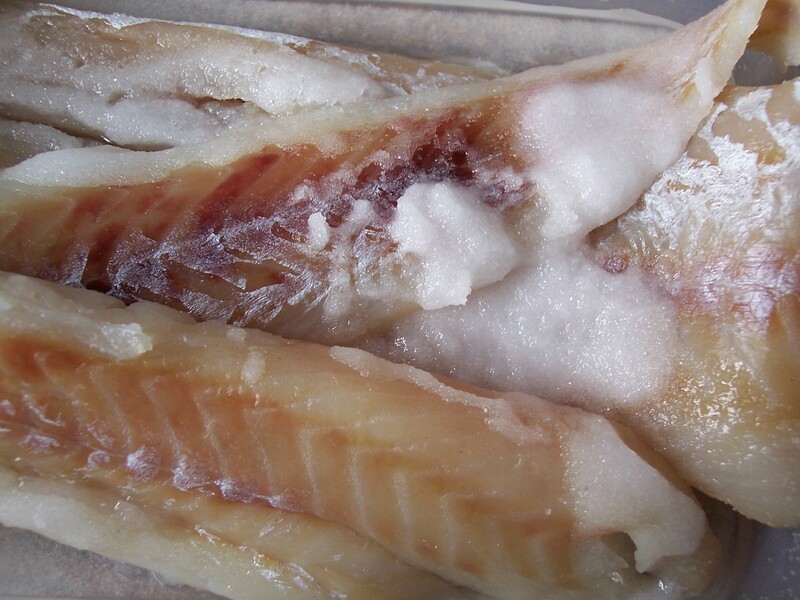 If using frozen fish then it should be thoroughly defrosted before salting and should not be re-frozen. 2. Pat the fish fillets dry with kitchen paper and put them in the plastic container in a single layer without overlapping. 3. Completely cover the fish with a thick layer of salt. 4. Put a cover on the container and refrigerate for 24hours. 5. After 24hours most of the salt will have turned to brine with the water drawn out of the fish. 6. This fish will now be sufficiently preserved to keep for up to a week in the refrigerator. The recipe does not say what to do with the brine but I poured away the excess liquid, leaving the patches of undissolved salt to continue the process. To prepare salt fish for cooking it should be soaked in plenty of cold water. If it is lightly salted this will take just an hour or two but fish that is more dried out should be soaked for up to 24hours. I usually give it a second quick rinse in cold water before use. Sometimes I think it is useful to add simple techniques to this site, especially if they are as versatile as this one for portions of pre-cooked chicken conveniently available for use in recipes or to eat cold. Some weeks ago I needed to make a batch of Mexican Style Chicken & Pepper Salad large enough to feed 50 people. It seemed obvious to poach the chicken first, along with onion and herbs for flavour, letting it cool before refrigerating until needed for the recipe. All I needed was some instructions: I did not feel I wanted to trust guesswork with such a large and expensive quantity. After some research I found a very clear method for poaching chicken at About.com along with another linked page giving additional information. The method is for cooking boneless, skinless, chicken breast pieces, a healthy option that does not require oil or fat and relatively low in salt as the amount used is controlled by the cook. There is no salt in the ingredients list for the recipe below which is simply flavoured by the onion and herbs. The resulting chicken is full of flavour, soft and juicy. The meat can then be used in any chicken recipe. It can be used hot in chicken pies, soups, stews and curries, though if adapting a recipe for uncooked chicken the pre-cooked meat should be added towards the end of the cooking time, providing enough time is given for it to be thoroughly reheated. It is just as good cold in sandwiches and salads (though unless necessary I would not choose to use meat from frozen batches as the taste is affected, albeit slightly). Poached chicken can be substituted in any recipe using cold meat leftovers from a Sunday roast or a shop bought pre-cooked chicken. 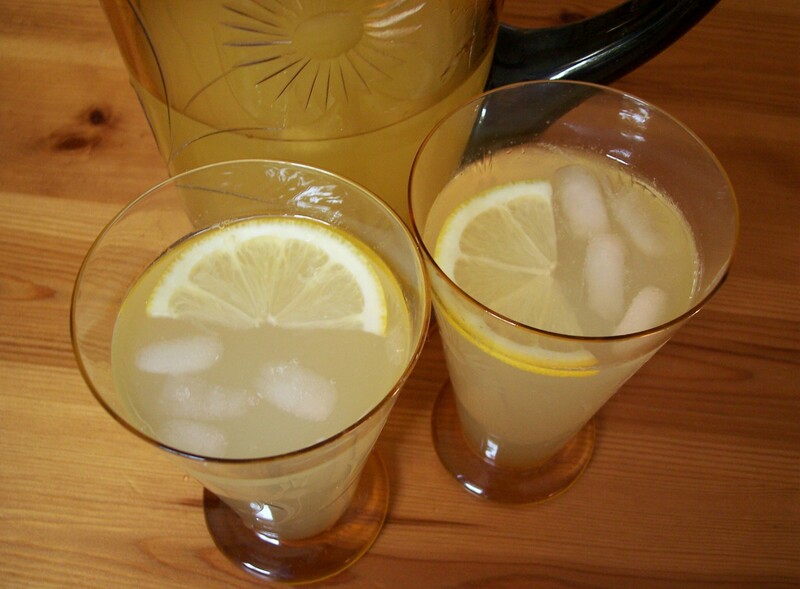 Poaching liquids can be varied: usually just plain water, the advantage being there are no strong flavours to clash with those in the recipe in which it is used. The water can also be flavoured, for example with herbs (as with my version below which uses onion and Herbes de Provence), pieces of root ginger or other spices. Alternatively substitute chicken or vegetable broth, white wine, cider, tomato or other fruit juice, coconut milk or other liquid. My sister in law uses a similar method pre-cooking belly pork pieces with root ginger to tenderise them, before using them in, Chinese Style Belly Pork & Greens/Broccoli/Bok Choy, a Chinese style stir fried pork dish and I am sure this method could be applied to other meats. carefully observe the instructions for use and storage once the meat is cooked. 1. Place chicken breasts in the bottom of a heavy bottomed pot just about large enough for them to fit in one layer. (Say how much in one layer and size of pot – see info on Mex chick recipe). 3. Bring the liquid to the boil and then lower the heat until it is barely simmering – just an occasional bubble rising to the surface. 4. Partly cover the pot and simmer very gently for 10 minutes. 5. Turn off the heat and leave the chicken to finish cooking for 10-15 minutes longer. 6. Remove the chicken from the cooking liquid and set aside. Remove and discard the bay leaf if used. Reserve the cooking liquid for use as stock – either strained or unstrained as the base of a soup. 7. The meat can either be eaten warm or allowed to cool for a short while before refrigerating for later use. The pieces can be left whole, sliced, shredded or cut into chunks depending on what you want to use it for. It is economical to cook a good quantity in one go, which can then be frozen in portions providing it is thoroughly defrosted before use.